Marbella borders on the municipal areas of Istán and Ojén (in the north), Benahavís (in the northwest), Estepona (in the west) and the Mediterranean Sea (in the south). Marbella is famous for its many hours of annual sunshine. During the high summer season, you can expect to enjoy 12 to 14 hours of wonderful sunshine per day. Uninterrupted daily sunshine is guaranteed for a solid 4 months of the year. Marbella boasts a typical Mediterranean climate which is characterized by mild winters and pleasantly warm summers. Although in July and August there are many days which see the temperature rise above 30°C. The region is also known to have its own ‘’micro-climate‘’. The weather of Marbella is milder than in neighboring areas because it is sheltered by the high peaks of the Sierra Blanca. 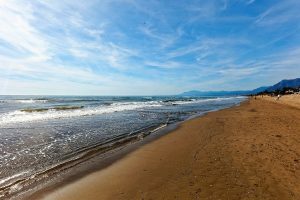 The hottest months in Marbella are July and august with an average temperature of 24°C and the coldest is January at 11°C. The wettest month is November with an average of 115mm of rain. The most rain falls from November through February, however, rainfall is rather minimal even during this period. For the rest of the year, rainfall is little with many months often not having rain at all. During the cold part of the year, the wind comes along with Atlantic disruptions, while in summer it blows in the form of afternoon sea breeze. In the westernmost part, the cool wind of Levante blows frequently from the East. The thermal variation of the water has a range of around 20°C in autumn and 23°C in summer. During winter, it drops down to about 16°C. The highest average sea water temperature is usually in August, September, and July. August is the best month to swim in the sea when the average sea temperature is 24-26°C. 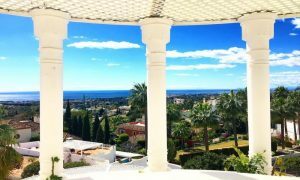 Known around the globe as a glamorous and beautiful destination, Marbella is a preferred location for the A-listers, boosted by international residents who are attracted by the jet-set lifestyle. 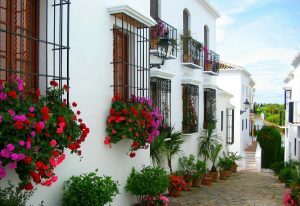 It also is one of the most popular regions for purchasing property in Spain. Here you’ll find the endless stretches of prestigious mansions, dream properties, and luxury developments. Prices on Marbella property market are the highest on Costa del Sol. The average price for an apartment is Average price per sqm. in Costa del Sol €3,144 -1% properties#: 12410 last change on: 19 Apr 2019 €3,144 per square meter and price for a house hovers around Average price per sqm. in Costa del Sol €2,921 0% properties#: 11096 last change on: 19 Apr 2019 €2,921 per square meter. However, highly appreciated sea view positions raise the average price of Marbella property. For investment opportunities, you can expect Average price per sqm. in Costa del Sol €5,917 -1% properties#: 1120 last change on: 19 Apr 2019 €5,917 per square meter. The most renowned real estate agencies operating on Marbella property market are Chesterton’s Affinity with more than 380 listings, Marbella Pads with more than 280 listings, Kristina Szekely (Sotheby’s) and Stand Inmobiliario, both listing nearly 200 properties. The municipality of Marbella is situated by the Mediterranean Sea, in the Málaga province. It is sheltered by one of its most renowned landmarks, the La Concha Mountain which is a part of the Sierra Blanca mountain range. The municipality extends along the coastline between Malaga City to the east and Gibraltar to the west. It has four main population centres: Marbella Town, San Pedro Alcántara, Nueva Andalucía, and Puerto Banús. Being the second largest region in the province, Marbella has a population of over 139,000 residents. With a very well-balanced size and population, it is famous for its cosmopolitan and multicultural environment. Around 25% of the inhabitants are of international origin, a figure that also doubles in the summer season. Of course, most visitors come to Marbella to relax and enjoy the sun, the sea and the sand. The beaches here are second to none, and many of them are awarded the Blue Flag. Marbella seaside reaches from Guadalmina to Las Chapas at a length of more than 27 km. Some of the most well-known stretches are Río Verde, Puerto Banús, El Ancon, and Nagüeles Beach. They all have good facilities, including water sports centres, plenty of quaint chiringuitos and exclusive beachfront restaurants. Whether you fancy trying local fresh seafood while curling your toes in the sea or sipping a delicious cocktail in the exclusive beach club, Marbella has it all. 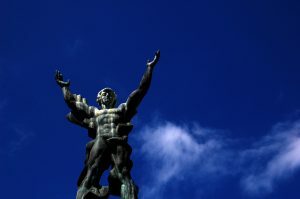 It is also world famous for its buzzing nightlife. There is no lack of late night bars and legendary nightclubs to keep you entertained. The most unique and classy venues are found in Puerto Banús and on the Golden Mile, which is a home to many celebrities and members of the Saudi royal family. 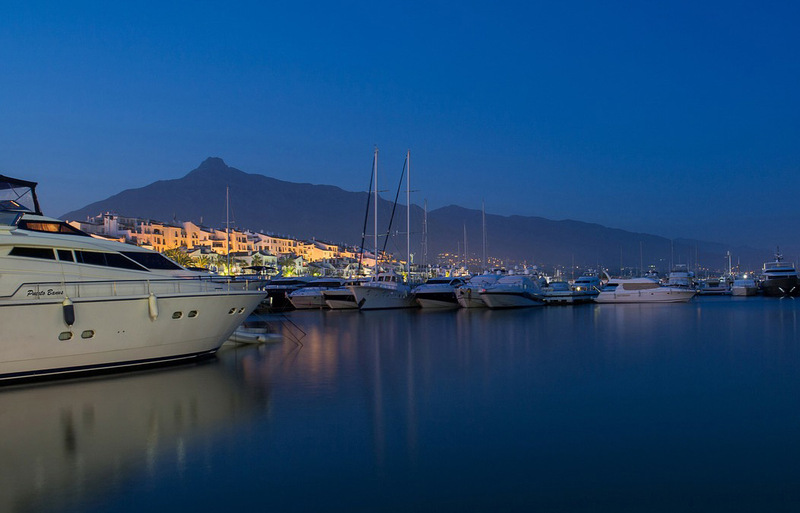 Marbella’s coastal strip boasts four marinas offering lots of yachting options. Together, they provide 1,800 berths, half of them in Puerto Banús. Guaranteed warm climate and countless hours of early sunshine, an amazing selection of courses with sea and mountain views make the region an extremely popular choice for international golfers. Marbella provides courses on all terrains and for players of all levels of handicap. The municipality is packed with numerous golf courses and some of the poshest club houses. 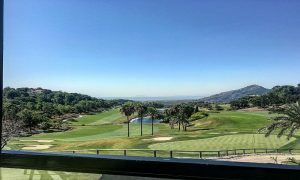 And also, it has the added bonus of being a short distance away from the best golfing facilities of Andalucía, the foremost golfing destination in continental Europe. Marbella is a gourmet’s paradise overflowing with exciting cosmopolitan restaurants and cozy-chic eateries and tapas bars. Here you’ll find everything from vegan cafes to traditional beachside chiringuitos, and Michelin starred restaurants such as Spanish cooking star Dani Garcia’s. Marbella offers a variety of places of interest, including the natural landscape of the La Concha Mountains and black sand beaches of El Faro. The center of the municipality, the town of Marbella is a union of cultures, offering concerts at the Arabic walls, museums hosting works by Picasso and Miró, and Roman archaeological sites. Here you’ll not only find a place for relaxation and leisure but also many opportunities to fulfill your appreciation for art and culture. In the surrounding regions, there is also a number of other areas with their own individual qualities. You can visit the ”white village” of Mijas and wander around its cobbled streets, have dinner in the mountains at Benahavis or go down to Gibraltar to see the rocks and monkeys that reside there. This way, with the most sophisticated atmosphere, facilities, and luxury properties, Marbella provides the perfect holiday and second home location.